Katherine was a really fun (and beautiful!) bride to photograph. I had photographed her brother's wedding at The Elms Mansion several years prior, and was delighted that she chose me to document her celebration as well. And a few years later, her sister also selected me for her wedding in Baton Rouge! With her wedding set to take place a few weeks later in New Orleans City Park's Botanical Garden and the reception at the adjacent Pavilion of the Two Sisters, she decided to do her bridal portrait in the park as well. We photographed in the Botanical Garden as well as in other areas of the park in the vicinity of the Peristyle. It was a beautiful Spring afternoon with great natural light to work with outside, and we got many great images, including this one from a series of shots in which she simply picked her dress up, laughed, and just let her delightfully happy and carefree attitude show through. 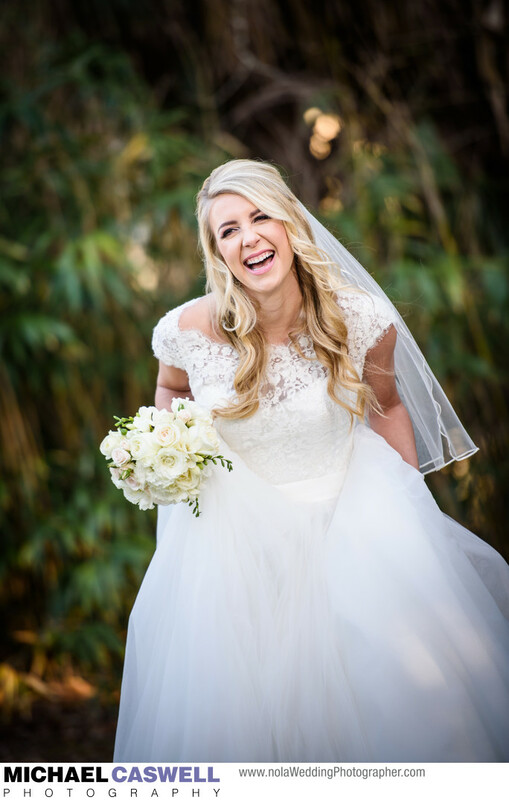 This shot perfectly captured this bride's wonderful personality and was my favorite from the entire session. While a traditional bridal portrait photography session is usually thought of as a heavily posed and precisely directed affair, this is a great example of how simply placing a bride (or a couple) in a spot with good light and a pretty background, and letting them just be themselves, can yield a great photograph.